Synology is more usually associated with NAS drives than routers, and when you first open the RT2600ac’s web portal you’d be forgiven for thinking you’d accidentally logged into a storage device, because it looks an awful lot like the company’s DiskStation Manager software. That’s good, though, because this slick, intuitive graphical interface makes many rivals look embarrassingly clunky and outdated. Icons, live graphs and illustrations help you to find your way around the system with ease, yet this is no Fisher-Price front-end. As you click through the various tabs, you’ll find no shortage of technical stats and network settings, including some notably upmarket features. 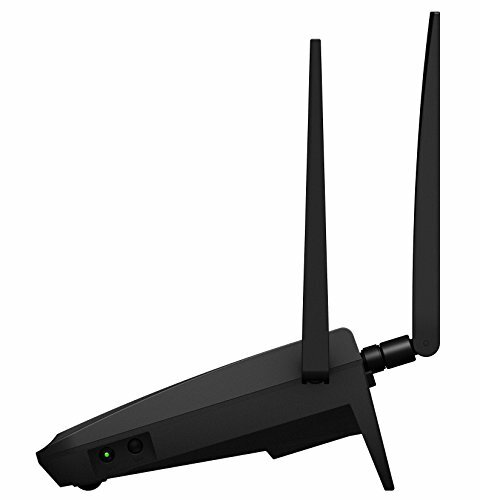 Those include a true wireless repeater mode, email and SMS notifications for specified errors and events, and the option to fall back to a connected 3G/4G USB adaptor if your main internet connection goes down. The physical design is just as thoughtful. 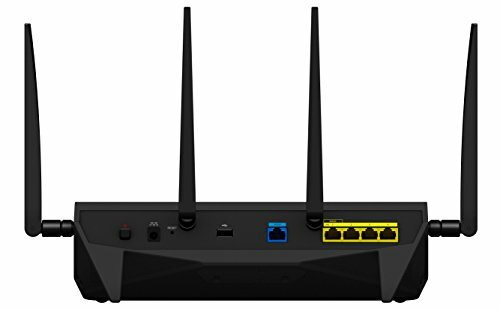 Alongside its four Gigabit Ethernet ports, the RT2600ac has a convenient switch for enabling and disabling Wi-Fi, a solid clicky WPS button and a sensible arrangement of USB connectors – a USB 2 port at the back for an always-connected 4G dongle or printer, and a more accessible USB 3 port at the side for storage. Uniquely, there’s also an SDXC card slot at the front, offering an easy way to get photos off a camera if your laptop doesn’t have a built-in reader. There’s even a physical Eject button that lets you ensure storage devices are safely dismounted before unplugging them – a great touch. 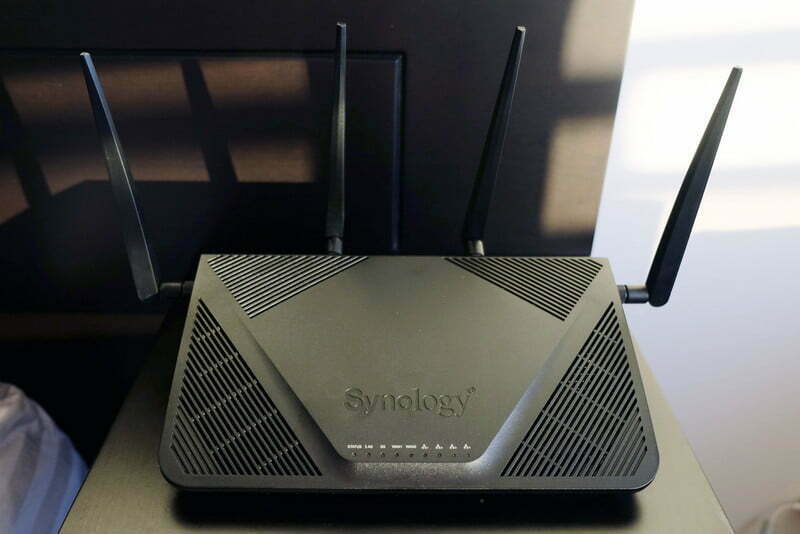 On the subject of storage devices, you won’t be surprised to learn that Synology’s router beats the rest hands down when it comes to file-handling capabilities, with entire pages of features transplanted directly from the company’s NAS platform. For example, you’re not just able to create password-protected user accounts for access to connected USB drives – you can let users choose their own passwords, enforce complexity rules and even insist on two-factor authentication. Or, you can use LDAP authentication, or join a Windows domain. Plus, as well as basic file sharing, you can enable services such as WebDAV and Apple Time Machine. To further expand the RT2600ac’s capabilities, it’s even possible to install apps from the built-in Package Centre. Synology’s Cloud Station and Download Station add-ons are a few clicks away, if you want them, as is the DLNA streaming server. Other services are more businesslike – a VPN server, a plug-in for RADIUS authentication, and Synology’s DNS server are also on offer. There’s a pretty solid set of parental controls too. You can set a weekly internet access schedule for each device on your network, optionally enforce safe searching and apply web filtering with varying degrees of strictness across 20 site categories. 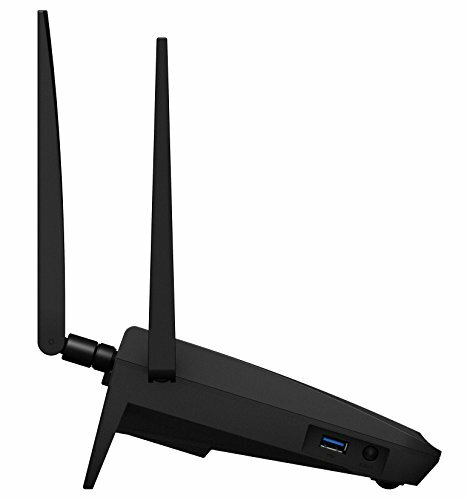 While the RT2600ac ticks a lot of feature boxes, though, its compact case and quartet of modestly sized aerials don’t scream high performance. 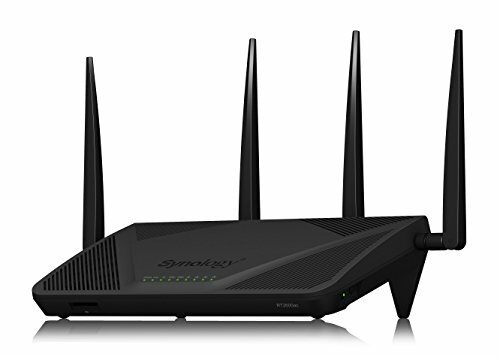 We found it couldn’t match the top speeds of bigger, pricier rivals: connecting from the same room yielded a maximum download rate of 22 MB/sec – a clear step behind the 28 MB/sec from the Linksys EA9500. Yet the RT2600ac did impress us with its consistency. 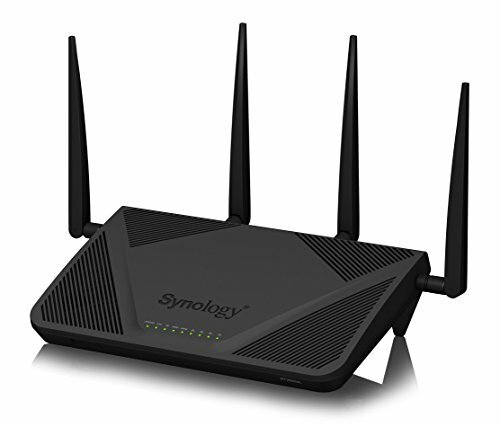 Moving up to the bedroom saw download speeds barely dip to 21 MB/sec, and even in the bathroom the Synology kept up a speed of 14MB/sec – on a par with the vastly more expensive Netgear Nighthawk X10, and faster than any other router on test. In short, we’re dealing with a more powerful radio than the headline speed might suggest. 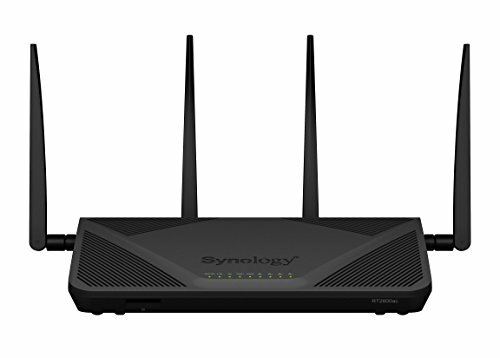 You can get a perfectly competent workhorse router for much less cash than the Synology’s asking price, and the similarly priced Linksys EA9500 Max-Stream offers faster speeds, twice as many Ethernet ports and a second 5GHz radio to keep your network running smoothly when it gets busy. However, the Synology’s feature set really helps to justify its price if it suits your needs. Much like the company’s NAS boxes, every time you open the interface to check your network status or change a setting, you’ll be glad you chose it. 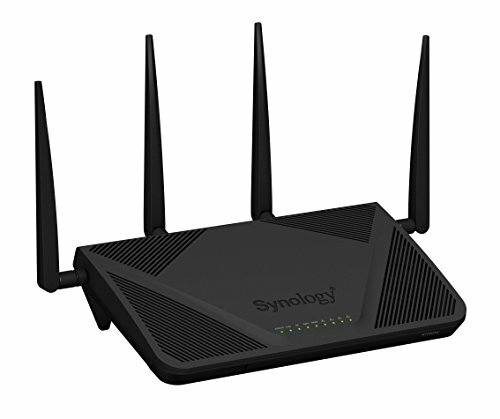 Not the fastest or best-value router on test, but the Synology's superb user interface and extra features make it a great all-rounder.